Founded in 1953, Kotobukiya has grown into Japan number 1 collector toy company, with a peerless reputation for quality and craftsmanship. The firm has developed a number of the world best-loved properties into exquisite collectible statues, figures, and kits that bring joy and value to fans the world over. 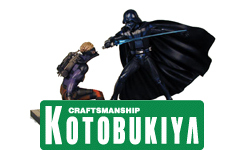 You owe it to yourself to check out the superb offerings from Kotobukiya!